Cuba, Mint and Used Stock, couple thousand organized in stockbook, Spanish period, American overprints and Independence, lots of dupl., mixed condition on 19th Century, otherwise Fine. Cyrenaica, Almost Complete Collection, Missing only the rare #CBO1, o.g. with some sets n.h. including 54-77, and C12-C17, J1-J7, one stamp o.g. balance n.h., Fine to Very Fine. Czechoslovakia, Collection in Scott Album, Few thousand mostly mint with some early used, lots of modern mint sets including Airmails and Semi-postals, generally Fine to Very Fine. 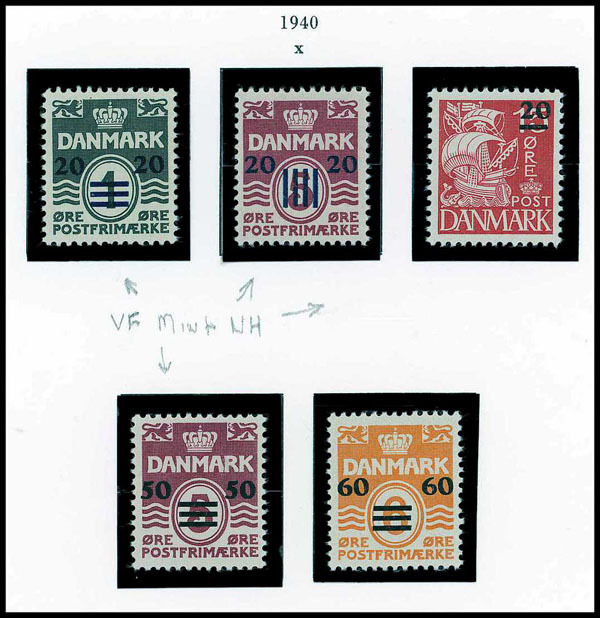 Denmark, Extensive Mint Stationery Stock, 1, 102, mostly mid 20th period but some earlier identified by Michel and/or Higgins & Gage numbers, priced and sleeved, some dupl., mostly $4-$10 range, incl. Aerogrammes, clean, total retail $8,982. Ex. Friedman "Cover Corner" Stock. Denmark, Mostly Used Collection, Few thousand from 1851 to 2004, in Scott album, including used #11-15, 82, 135, nice group of Parcel Post issues, and mint C1-C1, DWI collection, and mint Faroe Islands, Fine. Denmark, & D.W.I., 1851 to 1947 Mostly Used Collection, Mounted on Scott album pages, a useful group, noted #135 (used), incl. Semi-postals, Dues, Officials, Newspaper, etc. Egypt, Collection in Scott Album, Many hundreds from 1866 to 1957, early issues used balance o.g., better items include mint #5, 50-59, 92-103, 114, C1-C25 plus Palestine Occupation issues, generally Fine to Very Fine. Eritrea, Mint Mostly Complete, 1892 to 1934 o.g. missing only #CB01, J11-J12 and some Parcel Post issues, some sets n.h. including C7-C16, CB1-CB10, a wonderful collection of the difficult area, generally Fine to Very Fine. Estonia, Extensive Collection, Few hundred from 1918 to 1940, mostly o.g with a few used, better items include mint #78-79, 105-107, B9-B12, attractive collection of this popular area, generally Fine to Very Fine. Faroe Islands, Complete N.H., n.h., 1940, 1975-2002, 1940 set n.h. to l.h., with souvenir sheets, etc., clean, Very Fine. Faroe Islands, Mint Collection, Housed in Davo hingeless album n.h. from 1975 to 1989, plus year sets complete from 1990 to 2017, Fine to Very Fine. Finland, Mostly Used Collection, Few thousand in Scott album, including used #56-58, mint Semi-postals, #M8 on cover, o.g. Q1-Q13, and used modern Aland, Fine.